There are several turtle species that can be observed on Ocracoke. In the spring, one of them which you may come upon when you least expect it (as I did recently) is the common snapping turtle (Chelydra serpentine). During this time of the year the females will leave the water in search of a suitable location to lay their eggs. Others will leave their habitats in search of better ones. 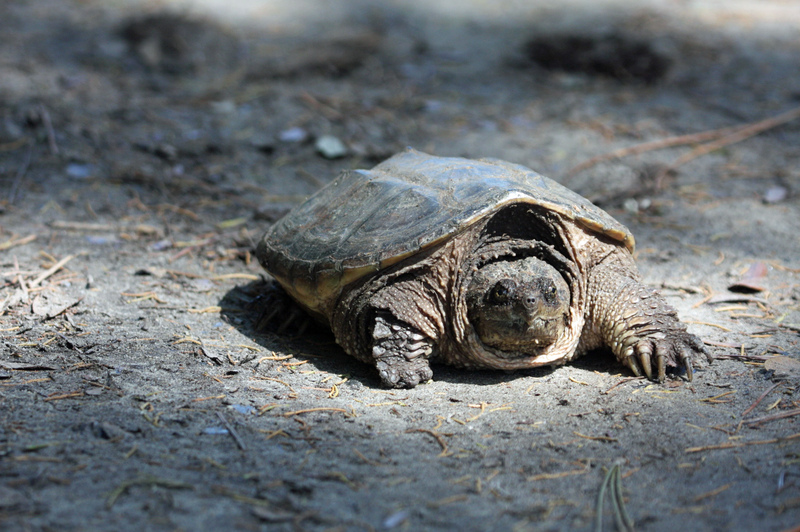 I have seen several snapping turtles on land this May and June (2013) in on the village. One of them, much larger than this guy, spent a morning in my neighbor’s yard digging a hole to lay her eggs. Such a clutch can be between 20 and 40 eggs and sometimes more. If all goes well, they will hatch in about three months from the time they were laid. As its name implies, the common snapping turtle can be found throughout the state of North Carolina and indeed throughout most of North America beginning in Southern Canada. They favor shallow fresh water ponds and streams that have abundant subaquatic vegetation though they can also be found in brackish waters including the mosquito canals that are found in the village. Omnivores, their diet consists of plant life as well as live and dead fish, amphibians, and just about anything of suitable size that may be unfortunate to find itself within its striking range. Unlike the aesthetically handsome and terrestrial Carolina box turtle that can be seen sometimes in the denser vegetation areas the village, these turtles convey a very rugged, even brutish and ancient look about them. They have three defined ridges on their upper shell (called the carapace), a large head and a long serpent-looking mobile neck. If you see one walking on land, just think of their name and do not try to pick it up. Snapping turtles are more vulnerable to predation on land than in the water and will be far quicker to defend themselves. They do not attack, but if you get too close, they will give a warning hissing sound. Their long, flexible neck, powerful jaws and quick reactions, makes it unwise to hold them. You do not need to help them find water. In the past few years, snapping turtles have been showing up in ponds in Italy. This is probably due to someone releasing their no longer wanted pets into the wild. A problem apparently that exists not just in United States. If you have an interest in this subject, a book you may want to pick up is Amphibians & Reptiles of the Carolinas and Virginia published by the University of North Carolina Press. It has great photographs, distribution maps and succinct text. Using it, I was able to ascertain that the glass lizard I found recently in my backyard was a subadult. It is available in at the Ocracoke Community Library.